Moneygram announced this week they are moving their European HQ from London to Brussels. Due to continuing Brexit uncertainty and concerns over UK financial passporting rights into Europe, payment companies are having to decide whether they need to pick up sticks and move. Not a small decision. Of the thousands of payment companies with a significant presence in the UK, only a handful have established offices in Europe and fewer still are either regulated or have their HQ in another country. 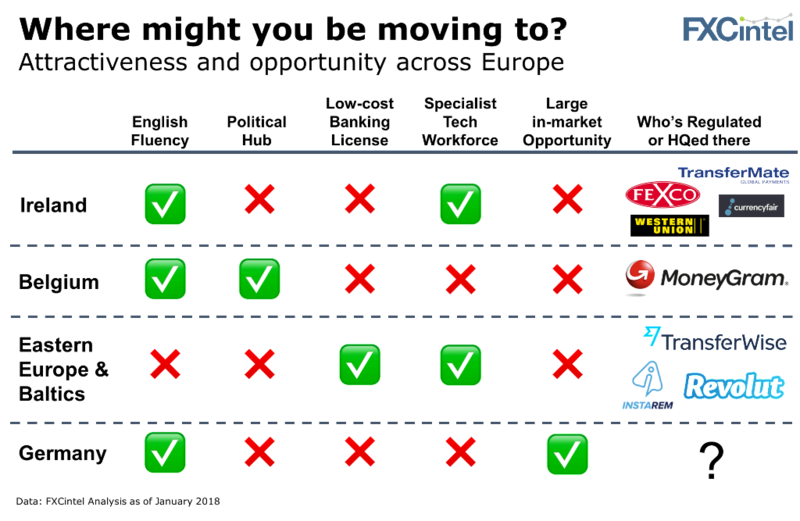 As our analysis above shows, there’s no easy choice for companies looking to relocate or hedge their bets. Of the five key factors – English fluency (a proxy for ease of doing business), political connections, a specialist tech workforce, lower-cost licensing and a large in-market opportunity – no country excels in more than two. In fact, the in-market opportunity appears to be the least dominant factor to date. Germany, which has the largest trading economy in Europe has no takers from the major payments players and has so far lured only bankers. Tech forward firms such as Transferwise, Instarem and Revolut have chosen Eastern European countries due to founder connections, large tech workforces and lower-cost licensing. Moneygram is moving to Brussels, likely not for waffles and chocolates but to lobby European politicians. Ireland has long been a tech and financial hub. Western Union is regulated there, and it is home to a variety of players such as Transfermate, Fexco, and CurrencyFair. Ebury, one of the fastest growing corporate focused groups has a presence across many European markets but has kept its HQ in London. We know many of you haven’t figured out where to setup yet – get in touch and we’ll help you assess the opportunities. In the coming months I will be attending the Money 20/20 Asia conference, which will be hosted in Singapore. As usual, our research team at FXC Intelligence is keeping tabs on the fintech scene there with great companies emerging such as Instarem and Toast. Below are a few more that continue to catch our eye. 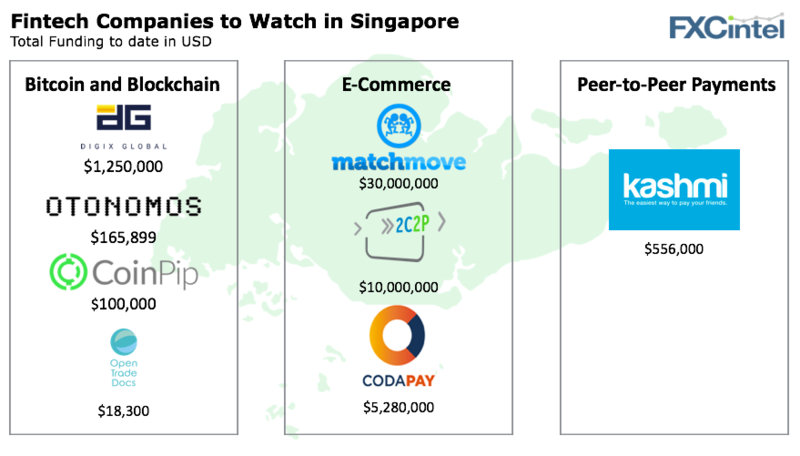 While none of these companies are focused on payments outside of Singapore yet, it is surely only a matter of time before we see that change.